Whether you are a teacher or a busy mom, Valentine candy craft ideas can help keep children creatively occupied for awhile. The following ideas are great for younger children, and when you only have a small period of time to complete a Valentine's Day craft. They make great activities for Valentine's Day parties as well as good gifts for classmates. Is there anyone that can resist hugs and kisses on Valentine's Day? Small tag or a computer created label "Hugs and Kisses"
Fill the jars with a few Hugs and a few Kisses. Write a note on the tag that says "To _____, Hugs and Kisses from ______. Alternatively, you can place a computer created label on the jar. A fun Valentine candy craft idea is to take two candy canes and glue them together to make a heart shape. 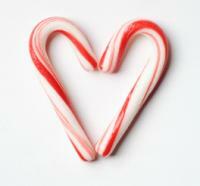 Glue the wrapped candy canes together at the bottom and at the tops to form a heart. Candy coated pretzel rods are fun and easy. Melt the white chocolate in the microwave on low heat. Stir the chocolate until it is smooth. Dip the bottom half of the pretzel rods in the melted white chocolate. Quickly sprinkle the candies over the chocolate covered pretzel rods. Place the pretzels in gift bags and use ribbon to tie them closed. Making rosebuds from Hershey's Kisses is a craft that most older elementary students can do. They make great favors for parties, wedding receptions, and spring teas as well. Fold the pipe cleaner in half. Place the Kisses on the cellophane so that the flat ends meet and the pointed ends point to opposite corners. Fold the cellophane over the Kisses to make a triangle. The Kisses are now contained inside a diagonal triangle. Fold the bottom point of the triangle up to meet the top point of the triangle. Twist the ends together at the top to make a rosebud around the two Hershey Kisses. Twist the chenille around the cellophane ends and twist it all the way down. Hold the silk leaves in place on the stem. Wrap the stem with florist's tape, keeping the leaves in place. Once you have covered the stem all the way down then wrap with the tape back up the stem a few inches. Repeat the process for each rosebud. 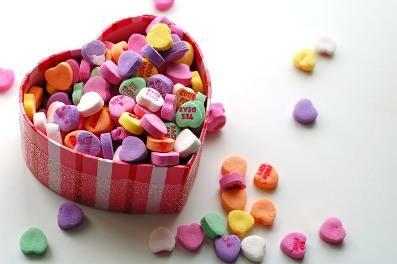 If you are using these Valentine candy craft ideas for kids, follow basic safety rules. Never allow small children be around glue guns without supervision. They get very hot and can cause severe burns if the point or the glue is touched. If you will be doing these crafts with a large group of children, make sure that there is sufficient adult supervision. Some children will require more help than others.